A non-linear, non-chronological discussion forum. Similar to the forum activity, but focuses on straightforward question-and-answer discussions. Additionally, users rate posts and gain a rating score ("reputation") by being rated by other users. Users who have started a discussion can mark an answer as helpful; and teachers can mark a post as a (correct) solution to the posed question. 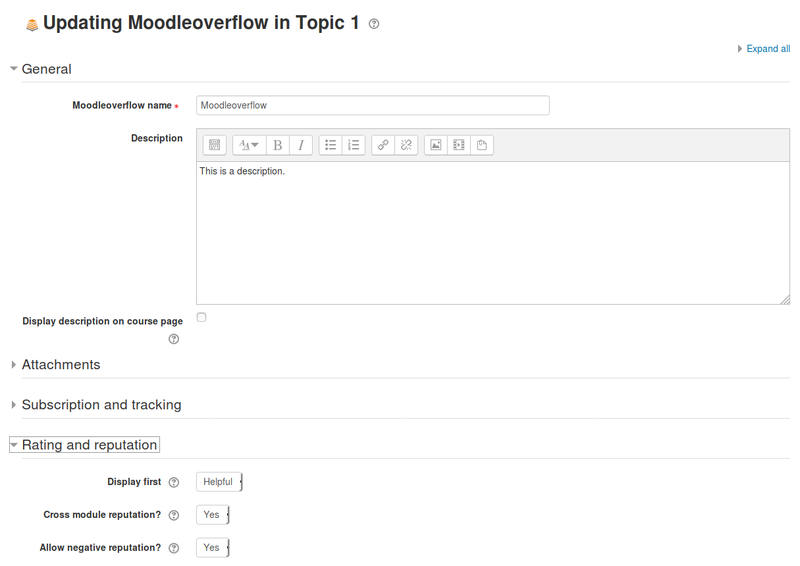 This plugin enables Moodle users to create a non-linear, non-chronologic discussion forum. The plugin has similar features as the Moodle forum, but is not intended for general discussions, but rather for straightforward question-and-answer discussions. Additionally, users can rate posts and can gain a rating score ("reputation") by being rated by other users. Users who have started a discussion can mark a post as helpful; and teachers can mark a post as a (correct) solution to the posed question. If a post is rated up or down, the post owner's rating score increases or decreases. The rating score of a user is always shown after the user name. In the settings you can define what amount of reputation a downvote or upvote gives. Posts with a high score are displayed further up than posts with a lower score. If a post is marked as helpful or solved, the post owner's rating score also increases. By default, a mark gives a higher amount of reputation than an upvote. A marked post is always displayed first, but you can choose which mark (solved or helpful) is more important. Every user can see the discussions and the posts. The discussion overview shows the status, among other things. Thus users can see if a discussion is already solved (green tick) or if a post is marked as helpful (orange tick). Posts can be marked as helpful (orange) by the question owner or as solved (green) by a teacher. The current post is marked blue. Additionally, everybody can vote posts up or down. The post are ordered by the number of upvotes. The post owner's reputation increases if the post is upvoted and decreases it the post is downvoted. Post owners can edit their posts until 30 minutes after posting. Teachers can edit and delete posts from everybody without the time restriction. Users can attach files. If a picture is attached, it will be displayed as image. If another file type is attached, the file will be shown but not the content. A discussion can be deleted by deleting the first post. Unlike teachers students can't edit or delete a post or mark it as solved. In the global settings you can set e.g. the number of discussions per page, the maximum attachment size or read tracking. In addition to these settings which are the same as in the forum, you can define the amount of reputation a vote or mark gives. In the course settings you can override a few settings like maximum attachment size or read tracking. Moreover, you can decide if helpful or solved posts are displayed first and how the reputation is calucated. If read tracking is set to "optional" and turned on by the students, the unread posts are highlighted. Depending on the global and course settings students can choose if they want to track posts and receive email notifications. When is mobile app supported? We have no plans for mobile support right now as we are not using the app at our institution. This might change in the future but, in the meantime, we welcome any contributions for mobile app support! Good job! I'll give it a try! Thanks! 1. VIEWS column - next [Status - Votes - Replies - [Unread] - Views] - In settings, there will be options; turning them ON/ OFF. It works great! Just one big thing that is really missing: mobile app supported! Big loss in these days where everybody uses their mobile device daily. I hope you will make this work soon. Sorry, we have no plans for mobile support right now as we are not using the app at our institution. In the meantime, if you'd like to help out we welcome any contributions towards mobile app support. Hi Carlos, thanks for the feedback. We have no plans for converting reputation into grades and we'd be unsure as to how this should be done exactly. If you have a specific idea how you'd expect this to work, please file an issue at https://github.com/learnweb/moodle-mod_moodleoverflow/issues. Also if you'd like to help out we welcome any contributions. Hi, it's a cool feature. BTW, it seems the posts on this does not show up in "Search Forum" searches. How to do the searching like in Search Forum? Really miss the fast asynchronous messaging (by AJAX), as it is everywhere now. I seem to get on the site from the 2000s. Do you know if it will appear in Moodle in the near future? Plugin is great. missing mobile app support. waiting for it. Hi Jan, I've been using this module in this semester and as teacher writing comments to students answers I miss having the previous post, the answer (or other comment) to which I'm responding, on top of the message editing box. Makes life much more difficult. 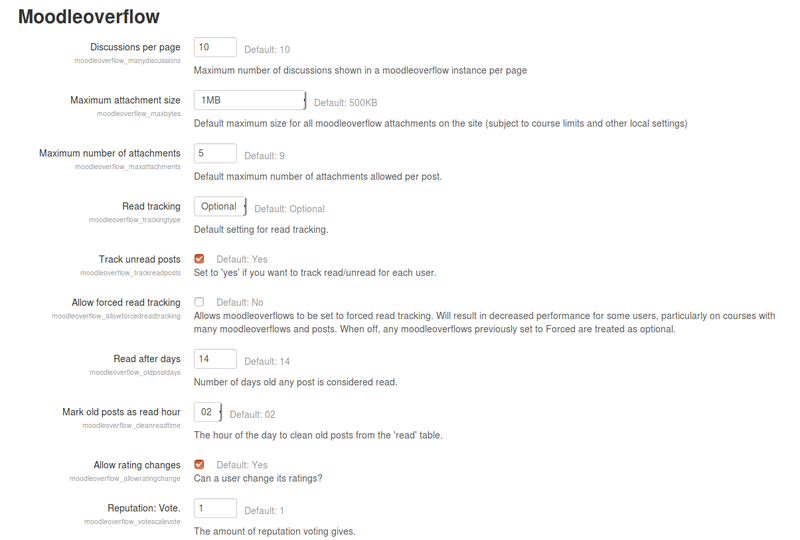 ¿Would it be possible to have moodleovverflow behave as the traditional post reponding page in moodle Forum? technical issu : can't add a picture from my pc in a topic ??? Any idea ? 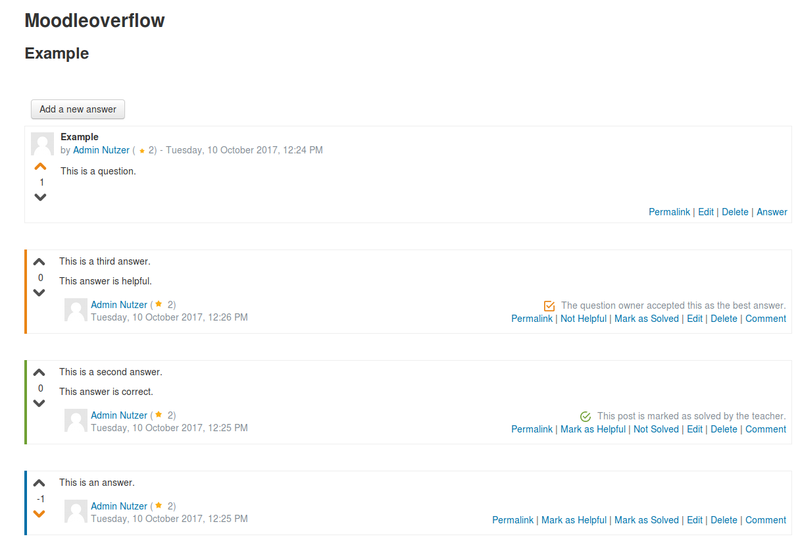 Hi, We are unable to search the contents in moodleoverflow. and it doesn't support to moodle mobile. Could anyone give any suggestion to overcome these problems?